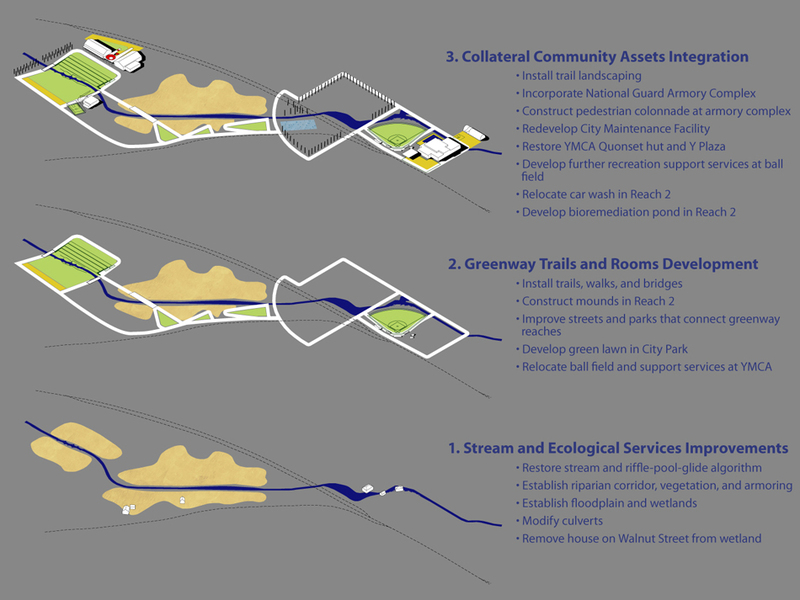 Distinguished by their contexts and fluvial profiles, three urban stream reaches are developed to create a new downtown greenway. The City Park Loop redevelops the park as an arboretum to normalize stream temperature. Floodplain Park converts the city maintenance yard to a wet meadow. YMCA Water Walk daylights the piped stream as part of a new “green street”. Floodplains become parks; newly armored riparian edges form public rooms; and mounded stormwater diverters double as pedestrian activity islands in the floodplain. Urbanism can issue from landscape media and their biological processes alongside that of the traditional street-and-block fabric.